"Marketing to American Latinos Part 1 by Isabel Valdes"
The "In-culture" approach to Hispanic marketing was introduced by Isabel Valdes, one of the premiere Hispanic marketers in the United States. 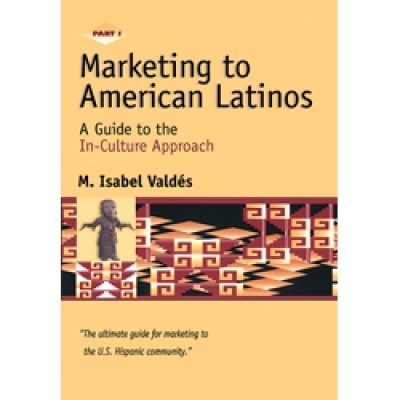 The first half of her two-part set of books introduces the Hispanic market and its culture, and helps you to understand the culturally sensitive issues you must respect if you plan to do business in this particular arena. Chapter 3: Is there a Hispanic "MeltingPot"? Chapter 7: Gaining "Share of Heart"